That is the best guess of what she had gone through. All the symptoms were detailed in yesterday's post. Our day continued onward. We had taken Lettie in to Family Pet Medical Center in Fort Lauderdale and she had spent a "Spa Day". They did manage to keep her there for observation and got her to finally eat something. The prognosis then was basically to allow her to rest and recuperate. Apparently Dogs can have a Stroke. They can get over the stroke and the brain damage will heal. Mostly. It will take time. I had to lift Lettie in my arms and walk her to the car. She was way too wobbly to walk the short distance to the car on her own power. 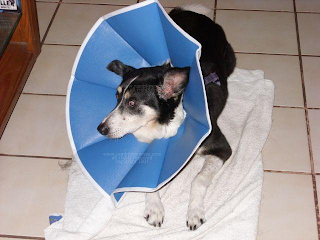 She's also got an Elizabethan Collar on her now, so her head looks like it is stuck into a blue lampshade. A Canine Daffodil. Lettie is a fighter. She laid on her mat all night from when we got home until it was time to let her relieve herself on the front yard. I was able to tell her it was time for walk, and got a wag out of her black and white tipped tail. Up she went, and after I removed the e-collar, we hit the front yard in the evening cool. Mrs Dog was not in a mood to run a marathon. I did manage to get her out by the tree near the house and empty her. I know she's a fighter because she had an interesting reaction. She sneered at me. I asked her if she wanted to walk, something she clearly understood both before and after the "episode". I annoyed her enough for the teeth to come up, the grumbling to start and a general snit fit of attitude to begin to brew. Good. It means that she may make it to the morning. I did break her out of her zombie phase out by the tree, and nudge her onward a few steps but I did realize that a long walk was out of the question. I scooped her up into my arms, not a favorite place, and got a few more grumbles for my troubles. Bringing her into the house, we refitted her with the e-collar so she would make it through the night with the catheter in her front leg, and will hope for the best. We got up at our usual 6AM. She woke when the bed frame thumped under my shifting weight. Smiling and wagging her tail inside of her blue lampshade. I got ready to take her out and carried her since I didn't want to chance her taking the two steps to the driveway. Since the irrigation was running, I had to walk her out to the street. Once on the street, I saw that her mind was still there. She wobbled around and looked at the grass. There she begun to sniff and act like a dog. I didn't expect it out of her, but over the next half hour she took me around the block. Twice. That's a mile. Her eyes are now more or less normal from the stand point of lighting. Yesterday they remained dilated, today they will shrink to a pinhole if you shine a light in them. She wanted nothing to do with her regular food - I can't blame her, the B Complex that the Doctor wanted her to eat was strong smelling. She also didn't drink. I solved both by giving her about a tablespoon on three crackers, then got a saline solution bottle from the cabinets and refilled with water. I was able to get about 200 calories into her and probably about 1/2 cup of water at the first try. I'm due for another shortly. Lettie never was a good one for "Personal Maintenance", she'll actually give you attitude if you brush her too long. I had to get three pills into her, and that was a trial in itself. That is, however good news. If they fight you they're going to fight for themselves. Now Lettie is on Steroids, Antibiotics, and Vitamins. That's a lot to try to get into a dog who doesn't even want to eat. When she's back on regular food, I'll start the vitamins, but the rest will get into her one way or the other. The last time she had her "episode" it took her about a month to be near normal. I'm seeing improvement already now that I know what to look for. I'll fight for her longer than she will fight for herself. It is the least that I can do. Unconditional Love Deserves To Be Rewarded. Thanks Cindy, you said it perfectly. I'll add "even if they don't want it".